Livelsberger was also one of 24 players selected to play in the L-L League annual senior all-star game, to be held March 27 at 6:30 p.m. at Hempfield High School. All players selected for the all-star team distinction are nominated by their coaches, with input given from coaches across the league, and it is easy to see why Baughman, Livelsberger, and Steffy all made the list. Under the direction of Donegal coach, and Kiera Baughman’s father, Thomas Baughman, the Indians were one of the few teams in the league with a trio of consistently double-digit scoring players: namely Kiera Baughman, Livelsberger, and Steffy. 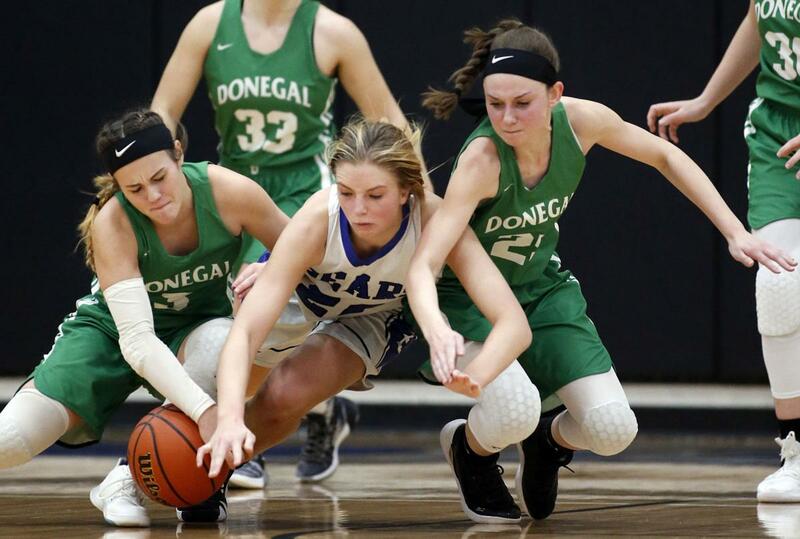 The three reliably led the way in scoring for Donegal throughout the season, with Livelsberger averaging 11.9 points per game, Steffy averaging 11 points in her final nine games, and Kiera Baughman averaging an impressive 21.3 points per game. Kiera Baughman was also one of eight players in the L-L League to surpass the 1,000-point career scoring milestone, and with 1,256 points scored already following her junior year, she could become Donegal’s all-time leading scorer following her senior year. Congratulations to all three girls!